How could you not love this pair of machine-embroidered hedgehogs framed in some fun springtime fabrics? Eagle-eyed quilters might recognize some of Denyse Schmidt's hard-to-find Flea Market Fancy prints in the mix. This pillow was made by Flickr user pinkpaisley. How about you? Have you featured any of your embroidery in your home decor items? Post your links in the comment thread! I have some pieced pillows featuring embroidery on the couch in our living room. The monogram is from Needle'nThread, and the flower is from Japanese Quilt Blocks to Mix and Match by Susan Briscoe. Kelly, your pillows are beautiful! That fabric line is one of my all-time faves. Thanks for sharing the link! Super cute! What is it about hedgehogs? 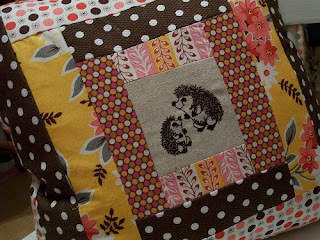 Love the hedgehogs and I have also used hand embroidery to make pillows . These are darling! They are so cute!!! I love hedgehogs!